Control 256 x10 devices and execute up to 1024 IR commands. 8 input low current relay module 8 inputs that can be configured as digital inputs, analog inputs (0-5V) or supervised inputs for detecting dry contact closures. 16 input module that can be configured as digital inputs, 4-20mA inputs, analog inputs (0-5V) or supervised inputs for detecting dry contact closures. 16 Zone IR modules expand the IR outputs 16 at a time with this flexible module. Store and replay 32 voice messages with this module. Have your home control needs grown beyond what your X10 modules and mini-controller can handle? Take the next step with the Ocelot Modular Home Control System, one of our most comprehensive home automation systems ever! This powerful, flexible and easy-to-use system offers two-way X10 control for 256 devices, execution of up to 1024 IR commands (with 2,000 lines of code) and activation of hundreds of relay-controlled devices. Together, these capabilities let you control virtually any light or appliance, remote control audio/video component, heating, air conditioning, or sprinkler system and so much more. The system lets you build macros on just about anything and offers the ability to send and receive ASCII text messages. 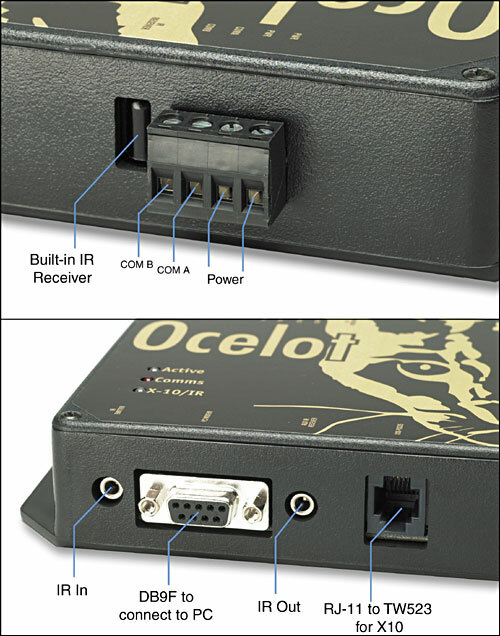 It also features a four-wire screw terminal that lets you connect various control modules, providing relay outputs, as well as analog, digital and supervised inputs. Up to 128 modules can be connected in a daisy chain (4,000 ft. max), giving you a grand total of 2,048 points (each input or relay output is one point).